Attending trade shows, expos, conventions, and other large group gatherings can help your business to increase exposure, create connections, and even gain traction in your industry. However, you can’t do any of that if you don’t have a professional, attractive trade show display to attract the right kind of attention AND to educate potential buyers, collaborators, and investors. 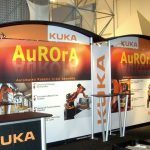 It is imperative that trade show displays capture the essence of your business, create a good impression, and are unique enough to help you stand out from everyone else who is there. 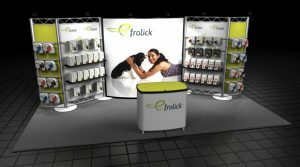 A thoughtful, well-done exhibit display will attract the right kind of people to your booth, allowing you to talk to them and sell them on your products and services. Even better, you’ll be able to get name recognition even from people who don’t stop by your display. None of this happens if your trade show booth isn’t fitted with the highest quality materials and signs. 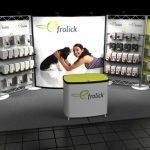 Since every business is unique, every trade show booth should be unique as well. 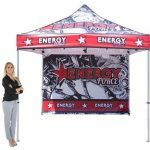 However, there are standard display elements that are commonly used by most trade show attendees. The key is in how you customize these elements to promote your brand and products. 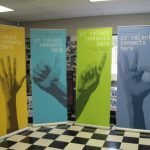 We can assist with not only determining the right elements to make sure your message is seen, we provide full design services to ensure that any printed and graphic elements are attractive, well-thought out, and put your most important messaging in the forefront. Our team will help to choose which elements are right for your business and the experience. 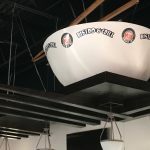 We will create a cohesive signage package that you can take with you to multiple trade shows, or can provide you with easily updateable designs for quick booth customization. We’ll talk about the message you want to send, the kind of people you want to attract, and how often you want to use your signage. All of this will help us to create a customized package for you. 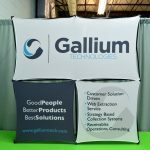 If you are planning on presenting your products or services at a trade show, convention, or expo near Houston, TX, we can produce all of your trade show display elements and have it delivered directly to your venue so that you don’t have to worry about anything being lost or damaged during shipping. 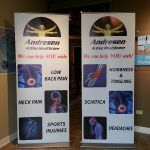 We’ll ensure that all of your trade show signs, banners, and display elements get there promptly and in one piece. 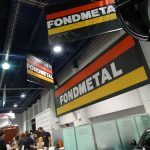 Depending on how frequently you attend trade shows and conventions, and the types of conventions you attend, you may find that a single trade show booth display is not adequate to properly send the right message to each group. We can create unique components and elements that speak to a specific audience, allowing you to cater your display to a particular show. Many organizations attend multiple trade shows annually, all with a slightly different focus. While your products and services as a whole probably do not change that dramatically, the way that it applies to a particular audience may be vastly different. For example, say that you sell latex gloves. When you are attending a trade show for the medical industry, your top priority may be on safety, durability, and ease of removal. You would want a display that is clean, sterile, and reinforces the idea that your gloves keep them safe and provide a benefit over the gloves they can get from other providers. Now, you may also attend a retail trade show where your goal is to get your gloves onto retail store shelves. Your value proposition for this audience would be more focused on the retail store benefits, such as your packaging is 25% smaller allowing for more inventory to be displayed in a smaller area, or your price per glove is $.03 less than the competitors, providing them with the opportunity to make higher margins. Although you are selling the same product, the same display would not effectively speak to both audiences. 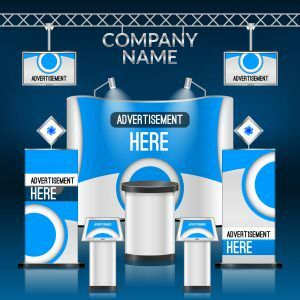 Our job is to create the right display for your target audience, that is easily customizable and adjustable to target other audiences without having to purchase entirely different elements. With small modifications and new printing, we can readjust the focus to specifically target exactly who you want to reach. 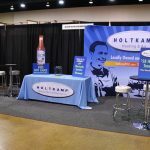 Not only do we provide trade show booth displays for attendees, we can also assist trade show organizers and venues with event signage, such as large-format banners, directional signage, floor graphics, and more. 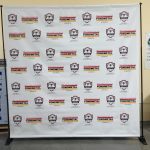 We can also serve as a signage partner for your event, providing special pricing on event displays for your attendees. We assist with all aspects of trade shows, conventions, and expo signage, and are ready to be a reliable, experienced partner for you. We are dedicated to creating an attractive, eye-catching trade show exhibit that attracts more guests to your booth, and provides you with the information and displays that you need to close the deal. Call Genesis Graphics & Signs, Inc. at (832) 293-4899 for your Free Consultation with a Trade Show Design Specialist!